Are you looking for ways to spend more time outside with your family and transform more of your outdoor area into livable space? If so, a fire pit surrounded by pavers could be the perfect solution! A fire pit and patio space with walkways made of pavers or artificial turf will give you the perfect area to relax with your family and entertain guests. 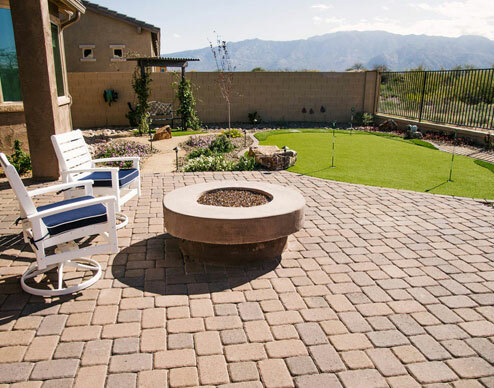 With Tucson’s climate, these no-water-necessary hardscape features provide the perfect way to get more use out of your outdoor space without introducing the need for irrigation or time-consuming maintenance. The size of the space. Do you want a spacious paver patio with an integrated fire pit and an area for a table and chairs? Or would you rather have a fire pit surrounded by a small area of pavers that’s just big enough to fit a few benches? What you want to use the space for. Will you use the fire pit primarily for relaxing with your family, or do you want to be able to accommodate several guests? What color pavers you want to use. Take some time to consider what colors will complement your home’s exterior, as well as the existing hardscape and landscape features of your space. When it comes to fire pits and paver patios, the customization options are limitless. With the help of a talented installation team, you will be able to design an outdoor space that is functional and offers the aesthetic appeal you’re looking for. Choose a location for the fire pit that is at least 10 feet from any structure and well away from covered porches and low-hanging trees. Clear vegetation from the pit before each use. Remove anything flammable that is downwind of the fire pit before each use. Don’t leave the pit unattended when in use, and keep a watchful eye on kids and pets. A New Creation can help your family get outside more often with fire pit and paver installation services, as well as artificial turf lawns and walkways. We will work with you to design a space that has all of the features you want, from an artificial lawn to putting greens and raised planters. 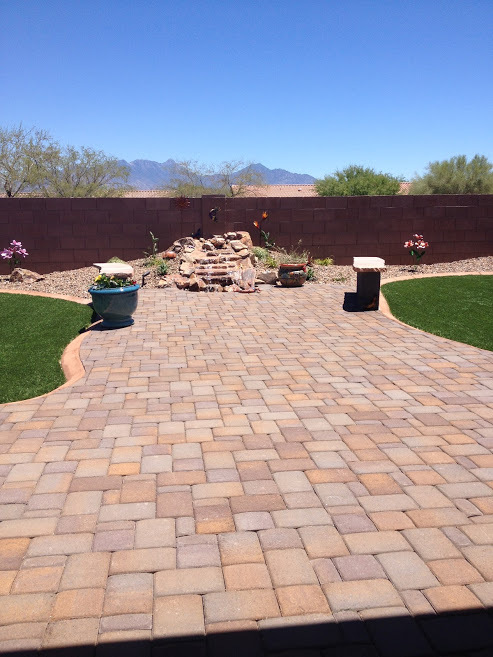 Learn more about fire pit, paver, and artificial turf installation in Tucson by calling (520) 730-3299.